In keeping with the theme from the #LifeThisWeek link up, (thanks to Denyse for hosting!) I thought I'd feature the book, Our Dog Benji. It is an adorable children's book that is released this month through Exisle Publishing. 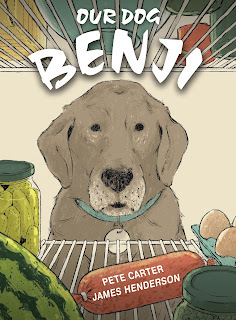 Benji's child owner isn't as daring when it comes to trying new foods, but over the course of the story, we discover how Benji's eagerness to eat anything from bones to bugs helps to encourage his young owner to try more foods. My youngest daughter and I read this story together and she loved Benji's antics. Sounds like a sweet book. Ahh, this is just the kind of book I need to start reading with Preschooler SSG who has a very narrow diet at the moment. Thanks for the heads up! This is cute - definitely a book to share with kids with sensory sensitivities or limited diets.